Vacationing with family or friends can be memorable; though, it may not always be the most comfortable. This is more than ever true when you must go halves on a bed with another person in order to save money by not renting out another hotel room. This system of travelling seems archaic nowadays and is better to be left in the past. 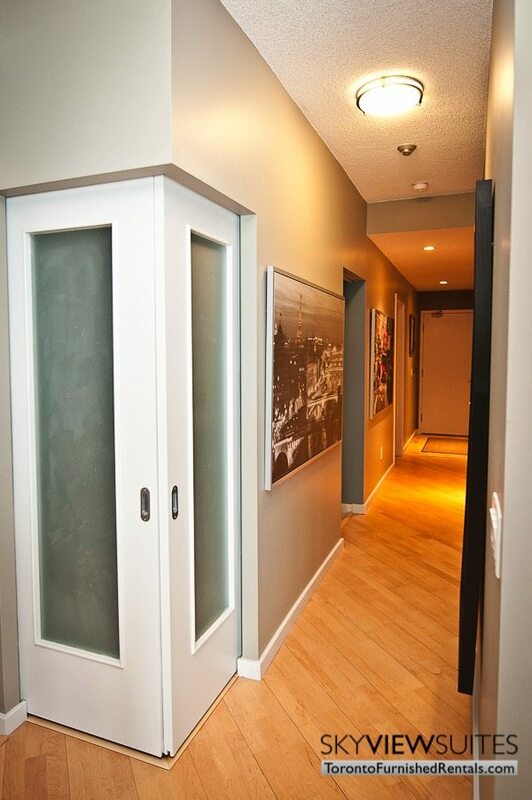 Furnished apartments for rent in Toronto are the future. This contemporary fully furnished two bedroom condo can be as restful as your own home since it is so roomy, 950 square feet to be exact. The living room is decked with a stylish couch, chair, and window seating. There is a flat screen TV which sits on a brawny entertainment center. Next to that is a desk which is ideal for working on your laptop or studying, and it can even double as a makeup counter. It is adjacent to the dining room which can seat four on trendy yet sturdy furniture. Since it is an open concept, you can look right into the stunning kitchen and see the stainless steel appliances, mosaic glass tile backsplash and granite countertops. Creating culinary inspired dishes is easy since everything is fully serviceable. You will enjoy the 9 foot high ceilings as well as the big bright windows that bring in rays of sun. Each bedroom comes with a queen sized bed, fitted with fine linens and carpet to keep your feet warm when you wake up. Also, each bedroom has its own full bathroom, no more waiting in lines. Of course you get more benefits when you stay at Toronto furnished suites, take for example the in unit washer and dryer. No more smelly clothes or runs to the Laundromat. Additionally, there is a bi-weekly cleaning service which comes by to clean your towels and linens. If that isn’t a big enough incentive then how about free digital cable TV and wireless internet? That comes standard too! Waterclub is an esteemed luxury condo positioned in the Harbourfront district, in the heart of downtown Toronto. It is the top tier of Harbourfront residences and will take your holiday getaway and turn it into a luxury stay. 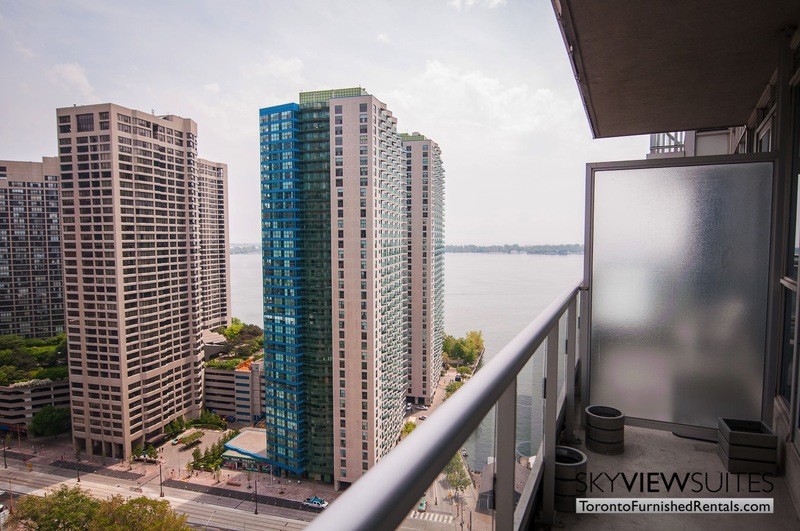 Impressively, it is just a few steps away from Toronto’s financial district. Presiding over Queen’s Quay from the leading location between York and Simcoe Street, Waterclub is a typical landmark of three recent towers, cleverly created so that each suite enjoys magnificent views of Lake Ontario and the city skyline from its balcony and solarium. The amenities at the Waterclub consist of an indoor and outdoor pool for cooling swims and a fitness facility to stay in shape. Also, there is a sauna for dry heat and steam rooms for added relaxation. If you feel like entertaining, there is a formal entertainment room with a kitchen as well as a billiards room and media lounge. This is the best value for the professional executives, or families and friends traveling together. Waterclub is situated next to the CN Tower and the Air Canada Centre, and is merely minutes away from St. Lawrence Market, Union Station and the Ferry to spectacular Toronto islands. 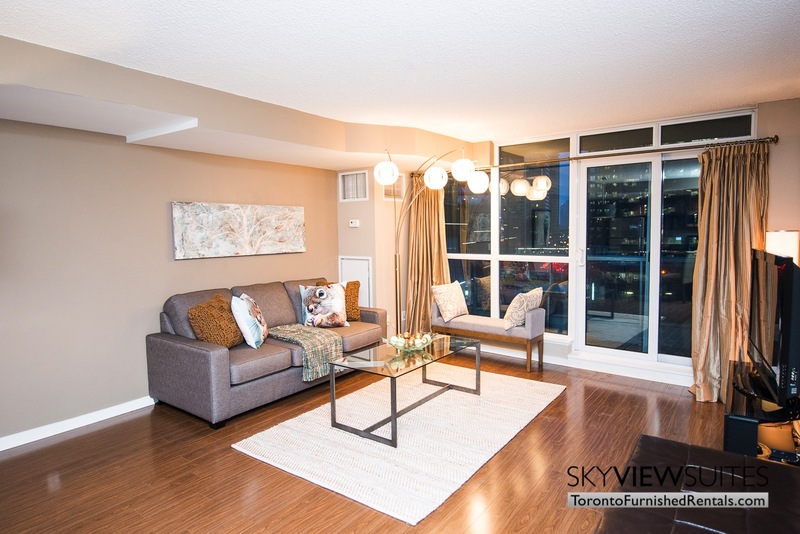 To make your Toronto accommodations at this unit or to see what else we have available, click here: Furnished Rentals.